Above is a picture of the first print version of Kumpulana, compiled and edited by Ria Koster, and published in 2005 by Psymon (the designer of this web site). A simple home-made, spiral-bound edition of 220 copies, it was originally created mainly for the families of the camp survivors whose stories have been presented here on this site. 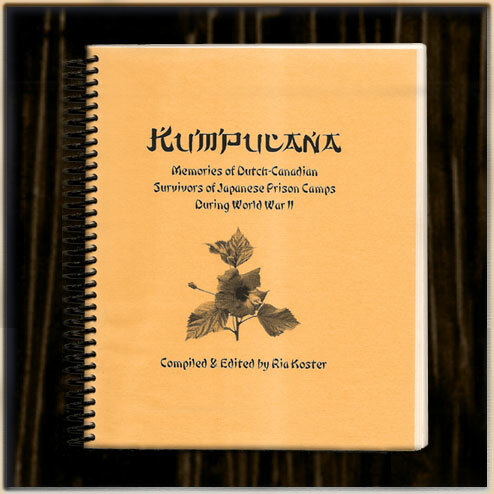 Kumpulana : memories of Dutch-Canadian survivors of Japanese prison camps during World War II / compiled & edited by Ria Koster. 1. World War, 1939-1945 — Prisoners and prisons, Japanese. 2. World War, 1939-1945 — Personal narratives, Canadian. 3. Prisoners of war — Canada — Biography. 4. Dutch Canadians — Biography.